Wear OS, formerly Android Wear, is Google's smartwatch platform that powers watches from dozens of manufacturers. Some smartwatch manufacturers include great functionality right out of the box, with their default apps, but you can turn even a budget-priced, bare-bones smartwatch into a powerhouse with the right smartwatch apps. Google makes it pretty easy to discover new smartwatch apps for your Wear OS device, with a pared-down version of Google Play available right on your wrist. In the Wear OS version of Google Play, you'll find a list of popular apps, a few handy categories, and even a list of apps on your phone that have smartwatch versions available. Since it can be so tough to sift through the thousands of smartwatch app options on such a tiny screen, we've assembled the 15 best Wear OS apps to help increase your productivity, access important information, and even stay entertained when you're away from your phone. All of the apps in this list are available for free from Google Play. Some of them have a premium version that you can pay money for, and others have optional in-app purchases, but you can use the basic version of each app without paying anything. Capable of automatically determining when you park, or you can manually tell it which location to remember. Includes options to help you remember where you parked in underground and indoor parking structures. The interface doesn't work right on some devices, which can make it difficult to access the find my car button. Automatic parking feature requires a Bluetooth device, like a Bluetooth car stereo, in your car. ParKing is a handy little app that's designed to take the hassle out of remembering where you parked your car. When you launch the app on your smartwatch, all you have to do is tap the little car icon to log where you parked. When it comes time to find your car, you'll be able to zoom in on a Google Maps view of its exact location. Extremely simple and easy way to create and access notes and reminders. Create notes and reminders on your watch, and then access them later from any of your other devices. Capable of connecting with both Android and iOS devices. Syncing issues can prevent you from seeing or accessing your notes. Lacks an option to open notes on your phone from the watch interface. Google Keep, which shows up on your Wear OS smartwatch as Keep Notes, is a lightweight note-taking app that's available on a wide variety of devices and also via a web interface. The version of Google Keep for your smartwatch lets you access your notes on the go, and jot down notes wherever you are. Notes created on your watch are synced to the cloud, so you can access them from your other devices later. Accurate forecasts displayed in a minimalist fashion that's well suited to small smartwatch displays. Includes an option to launch the companion app on your phone for more detailed forecast information. Weather information is sandwiched between menu buttons at both the top and bottom of the screen, which can make scrolling through hourly and daily forecasts touchy. No support for switching between multiple locations. The AccuWeather app brings the same forecasts you can access on the web or your phone to your Wear OS smartwatch. You don't get their MinuteCast information, radar, or any other bells and whistles, because the information is pared down for the limited screen real estate available on smartwatches. What you do get is a weather app that's easy to read at a glance. Download podcasts directly to your smartwatch, so you can go for a run and leave your phone at home. Options to either automatically or manually download new podcast episodes. Podcast discovery feature if you're looking for something new. Does require a phone to import podcasts, so it isn't completely independent of your phone. Requires Android 7.0 and newer on your phone, so it doesn't work with some older phones. Wear Casts is a standalone Wear OS app, which means that it works completely independently from your phone (except for getting podcasts to the watch). You can actually use Wear Casts to download podcasts to your watch, pair some Bluetooth earbuds, and listen to them whenever you want, even if your phone isn't within Bluetooth range. Since Wear Casts doesn't require a constant Bluetooth connection to your phone, it's also easier on your batteries than some other apps. Allows you to use your smartwatch to do almost anything your Alexa is normally capable of doing. Great for extending Alexa functionality into rooms where you don't have an Alexa, but you do have smart devices like lights. Not compatible with all skills, and lacks some functionality of an official Alexa device or app. Amazon has an official Alexa app for Android phones, but it isn't compatible with Wear OS. That's where the third party app Listens for Alexa, also known as Alexa Listens Wear, comes in. This app brings Alexa to your wrist, and it includes most of the functionality of a real Alexa device. You can even use this app to control any smart home devices that you normally control with your Echo. Makes it easy to generate shopping lists right on your watch. Allows you to store your loyalty card details, so you don't need a separate app for that. Includes the option to share your shopping lists with family members or coworkers. No option to automatically add items via a bard code reader. Searchable library of items only includes generic descriptions, not specific brands or products. Bring! is a shopping list app that lets you create, edit, and even share lists right from your smartwatch. It includes a library of items with easy to understand icons, and you can even add items to the list using your smartwatch's voice transcription functionality. Offers detailed trip timing for public transit options, walking, and even bicycling. Allows you to create routes that mix transportation types, like a cab ride to a subway station. Also provides Uber details, so you can go that route if it would save either time or money. Very limited availability. Only works in about 30 cities worldwide. Departure times aren't always accurate, so make sure to double check. Citymapper is a must-have if you use public transit in one of the cities it covers, or you're planning on visiting a supported city. It brings a ton of information about bus, train, subway, ferry, and even taxi data right to your wrist. The downside is that it's only available in a limited number of cities, and it's totally useless if you don't live in any of them and don't plan on visiting. The Sleep as Android smartphone app has a ton of options, including a lucid dreaming mode. Integration with the Sleep as Android phone app allows your watch to track minor movements and disturbances as you sleep. This is pretty much the only game in town for real sleep tracking on Wear OS. It doesn't work at all without the Sleep as Android app on your phone. Setup is somewhat confusing, as you can't download it to your watch directly from Google Play. 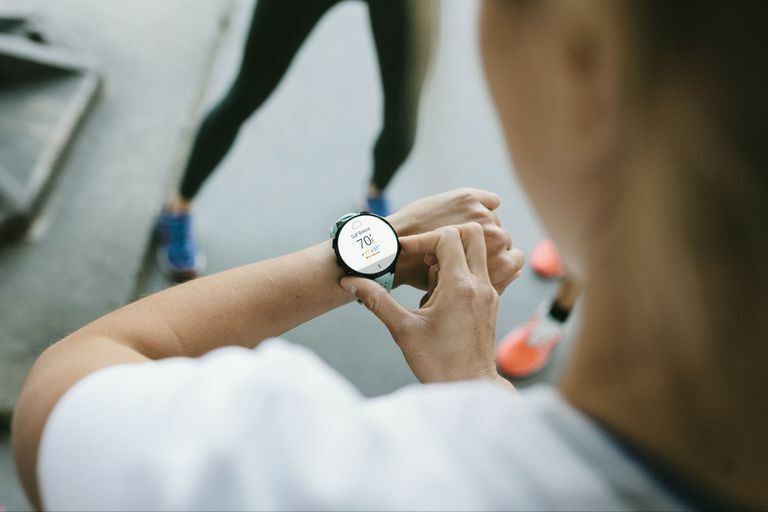 One major function that Wear OS smartwatches lack, when compared to dedicated fitness devices like Fitbit, is sleep tracking. There's also a major lack of sleep tracking apps on Google Play that work with Wear OS at all, but Sleep as Android fits the bill nicely. Sleep as Android includes a ton of features, some of which aren't even available from dedicated fitness devices. For instance, the lucid dreaming mode is able to determine when you enter Rapid Eye Movement (REM) sleep, and provide an auditory cue to help you realize you're asleep without fully waking up. The only real downside to Sleep as Android is that the smartwatch app doesn't work independently from your phone. So you have to make sure your phone is charged up, paired to your watch, and nearby whenever you go to sleep. Use the Apps on Your Phone section in the Google Play store on your watch to download this. It's your Google Authenticator, but on your watch. It doesn't work without your phone. If you already use the Google Authenticator app on your phone, then this is a great accessory app to add to your arsenal. It provides easy access to all of your authenticators via a swiping motion, and the numbers are big enough that they're easy to read even on small smartwatch screens. The only downside is that it relies on your phone to work, so it can't act as a backup for the authenticator on your phone. Places the operations buttons in a sliding drawer on the side, so the number buttons can be as large as possible. No scientific calculator function, so you'll need to look at premium apps if you want that or graphing functions. If you're a whiz at mental math, then having a calculator on your wrist might not have that much appeal. For the rest of us, Google's basic calculator app is an awesome answer to the clunky calculator watches of the 1980s that takes the headache out of calculating tips. Access to a ton of free watch face designs. If you don't see anything you like, you can create your own watch faces. Bluetooth errors can prevent you from downloading new watch faces. Feels sluggish on some devices. There are a ton of both free and paid apps that provide access to new watch faces, and Mr. Time is at the top of the heap. It includes a ton of free watch faces, premium watch faces you can buy, and you can even design your own. Makes it easier to access range information when you're golfing, since you don't have to pull your phone out before every shot. Decent course coverage, including a lot of small local courses. Doesn't work without a phone. Includes nice analysis tools you can check out after your round, but you need to use your phone for that. Hole19 is primarily a golf range finding and score tracking app that runs on your phone, but it has an accessory smartwatch app that let's you access the most essential information from the convenience of your wrist. If your local course is included in the more than 40,000 courses that Hole19 covers, you can use both the smartphone and smartwatch app for free. There is a paid version, but it primarily provides access to high resolution graphics rather than unlocking additional course information. Simple game mechanics work well with the limited screen space. No cloud saves, so if you have to reinstall you lose your progress. Despite the extremely limited screen space available on Wear OS smartwatches, there are actually some decent games available for the platform. Infinity Loop is especially well suited to play on small screens, as this puzzle game makes use of the pretty basic mechanic of tapping puzzle pieces to rotate them until they form a pattern. It's pretty easy to pick up, and it's very basic compared to a lot of the great smartphone games out there, but it is a nice little time waster that you can play without pulling out your phone. Automatically generates reminders on your watch, and phone, to take a drink. Makes it a lot easier to stay hydrated if you have a habit of not drinking enough water. The default slurping noise it makes to remind you isn't very appealing. There are a ton of benefits associated with staying properly hydrated, but most people have trouble remembering to take a few sips here and there throughout the day. Water Drink Reminder is designed to remind you drink, at regular intervals, so that you take in an optimal amount of water based on your height and weight. It also runs on both your phone and your smartwatch, so there's less of a chance of missing a reminder. Automatically reorients the map based on the direction you're facing. Makes it easy to find local points of interest. Very pared down in comparison to the regular Google Maps app. Google's native map app is an easy sell on Wear OS. It's pretty simplistic compared to the full smartphone app, but it does make it extremely easy to orient yourself, and find local points of interest, when you're walking around on foot. It also allows you to drop a pin at your destination and launch full navigation on your phone.